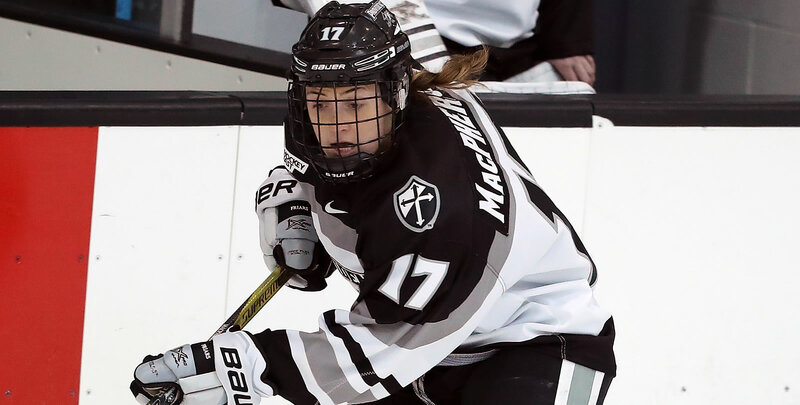 PROVIDENCE, R.I. - The Providence College women's hockey team defeated the Bemidji State Beavers, 4-1, in the 2018-19 season opener on Oct. 5 at Schneider Arena. - Maureen Murphy (Buffalo, N.Y.) wasted no time kicking off the 2018-19 season. She scored her first goal of the season 2:51 into the contest. Sara Hjalmarsson (Bankeryd, Sweden) and Cassidy MacPherson (Oakville, Ontario) assisted on the play. - Hjalmarsson's assist was the first of her career. - Providence opened the second period in a fast fashion, scoring 1:04 in. Neve Van Pelt (Mitchell, Ontario) passed the puck to Hayley Lunny (Bedford, N.Y.) who pushed a backhand in on Kerigan Dowhy. She made the initial save, but Meghan Rickard (Coventry, R.I.) was there to bury the rebound. - Lunny scored a goal of her own at the 4:12 mark of the middle stanza. She skated in from the left boards and roofed a wrist shot over Dowhy's shoulder to give Providence a 3-0 lead. - BSU cut into the Friars' lead at the 6:40 mark of the third period. Abby Halluska scored the goal following a scrum in front. - MacPherson re-extended the lead to three goals with less than eight minutes remaining in the game. Kate Friesen (Altona, Manitoba) looped a long shot in on goal from center ice. MacPherson skated in on the rebound and put it past Dowhy for her first goal of the season. Murphy picked up the secondary assist for her second point of the game. - Madison Myers (Colchester, Vt.) made 26 saves on the night, including a big one on a shorthanded breakaway for the Beavers in the second period. - Matt Kelly picked up his first career win as a head coach in his first game with the Friars. The Friars continue the series against Bemidji State in a 2:00 p.m. game tomorrow (Oct. 6).